• March to April There was several, non-Panda related updates which could have affected your site. • 19th April 2012. Don't confuse changes resulting from this update with those from the Penguin webspam update of (approx) 24th April. That's a whole other thing. • 24th April 2012. This the Penguin webspam update and not Panda. • 27th April 2012. Yes, just eight days after the previous Panda. Apparently this was a 'small' update. • 24th July 2012. Said to have affected 1% of searches and not though to have been an important one. • 20th August 2012. 1% of search again affected. • 27th September 2012. 2.4% English queries, impacted, belatedly announced. • 28th September 2012. Non-Panda - this one hit Exact-Match Domains. Less than 0.7% of "low quality" sites affected this time. • 5th November 2012. Panda - 1.1% of English-language queries in US; 0.4% worldwide; confirmed, not announced as of 6th November. • 21st November 2012. Panda - 0.8% of English-language queries; 0.4% worldwide; confirmed, not announced as of 30th November. • 21st December 2012. 1.3% of English-language queries affected, officially confirmed as a "refresh". • 22nd January 2013. 1.3% of English-language queries affected, officially confirmed as a "refresh". • 15th March 2013. Panda - confirmed as coming but not confirmed as having happened. Google says that no further "updates" will happen but that Panda will be rolled out along with normal algorithm changes. • 22nd May 2013. Penguin "2.0" or "#4" update. 2.3% of English-language queries affected. 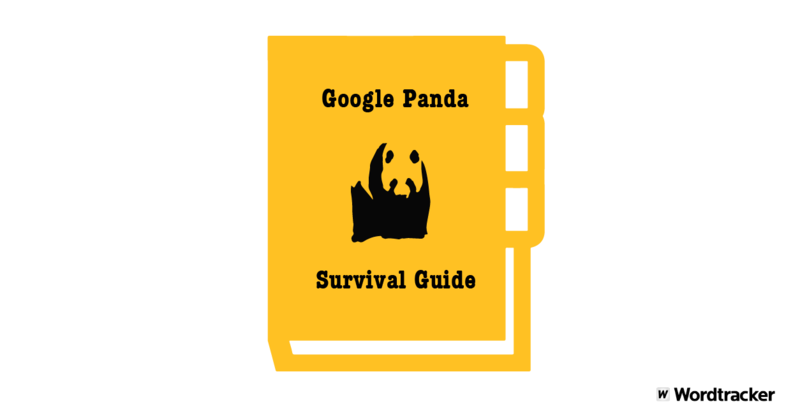 Why did Google Panda slap quality sites? Enter ‘United States’ into the filter at the bottom of the list of countries. That’s more than a 50% drop in organic (non-paid) visits from Google US. Scared yet? Choose ‘Advanced Segments’ from the left hand menu and then ‘Create new segment'. Apply this segment to your GA reports and all the data you see will now be for this segment of visitors only. As you’ll see below, this allows you to look at which of your pages have fared best and worst from Panda. Before we do that, let’s explore what Google are trying to do. What in the name of Google is going on? The last thing Google wants is searchers being unhappy with what they find. They might try another search engine if that happens. Few people other than the low quality sites’ owners and their investors will have a problem with that. But all major Google updates leave ‘collateral damage’ behind them: sites that just don’t match the target or deserve to be penalized. Google are aware of this and so have asked those with “a high quality site that has been negatively affected by this change” to let them know about it here. So if you have a high quality site that’s been adversely affected by Panda Farmer then let Google know. The site used as an example on this page is a high quality site hurt by Panda. It’s core content is hundreds of long in-depth specialist articles plus a Q and A based forum for readers’ problems. Perhaps the Q&A pages are the problem (those pages could like thin content to Google's robots). But then I know of two similar sites in different markets that have also been hit but don’t have the Q & A based forum. No, it wont be that easy to work out why an innocent site has suffered. Google like to keep these things secret but the two engineers at the heart of Panda, Matt Cutts and Amit Singhal, gave us some strong clues in an interview with Wired. • Conduct qualitative research (that’s speaking with individuals and not a big questionnaire) to find out which of a sample of sites they considered to be low quality and why. • Use the results to define low quality sites with the factors that Google can measure. This gives Google a mathematical definition of low quality. • A high % of duplicate content. This might apply to a page, a site or both. If it’s a site measure then that might contribute to each page’s evaluation. • A low amount of original content on a page or site. • A high % (or number) of pages with a low amount of original content. • A high amount of inappropriate (they don’t match the search queries a page does well for) adverts, especially high on the page. • Page content (and page title tag) not matching the search queries a page does well for. • Unnatural language on a page including heavy-handed on-page SEO (‘over-optimization’ to use a common oxymoron). Eg unnatural overuse of a word on a page. • High bounce rate on page or site. • Low visit times on page or site. • Low % of users returning to a site. • Low clickthrough % from Google’s results pages (for page or site). • High % of boilerplate content (the same on every page). • Low or no quality inbound links to a page or site (by count or %). • Low or no mentions or links to a page or site in social media and from other sites. Multiple factors will likley be required to get ‘Panda points’ (and points do not mean prizes in this game). Panda points will be added up. Cross a threshold (the Panda Line) and all the pages on your site seem to be affected. This includes quality original pages being ranked well below useless scraper sites that have stolen your content. It's important to define the difference between an algo change and a penalty. A penalty must be served if it has a time limit and lifted if it is to be removed. An algo change exists and its results will continue until it is changed, your site changes (or your site gets whitelisted). Panda is an algo change but no ordinary one. It's an algo change that works like a penalty because if your site crosses the Panda Line then the whole site is affected, quality pages too. Panda is penalty by algo. Thanks to Franz Enzenhofer for pointing out a misreading in an earlier version of this article of Matt Cutts use of the word 'block' in the Wired interview. Is a Panda Slap applied site-wide or at the page level? • Types of pages that can be identified by shared strings in their URLs. Eg forum pages might all have /forum/ in their URLs. I’ve done this on a few sites hit by Panda and I can say that some pages were hit more than others and a few did well out of Panda. So Farmer Panda is at least to some degree working at the page level. If your site has been hit then use the filter on GA (as shown above) to find out which pages got hit most by Panda. I found lots of pages with high quality, unique, in-depth (sometimes thousands of words long) articles that were hit much harder than average. So again, there are no simple answers here. But these did have more advertising on them than average for the sites concerned. Some forum pages had significant increases in visits. These had long threads, a fair amount of advertising on them (including a pop-up) but less than some other pages. On this site, I would try changing some of the advertising. In particular, there is a big ‘block’ of advertising that doesn’t feature on the forum pages. That might not be enough or have any affect at all. For example, on another site I’ve seen hit by Panda, all marketing was removed and no changes have followed (more time might be needed though). Is a Panda penalty applied at the keyword level? • See if Panda has had different effects on traffic for those different keywords (but to the same page). If it has then Panda is operating at the keyword level. I’ve only seen a few examples of Panda having reduced visits to the same page with some keywords but not others. But they are the exception. • 36 scraped versions of the article. • two showing above the page with the original. • one of these being a low quality scrape on a low quality site. • The other being a part scrape that credits and links back to the original. • The original page has lost 75% of its organic US Google traffic since Panda. • That traffic came from over 1,000 different keywords and of those I tested none had been spared. • Find the pages and page types hit worst on your site. • Isolate differences between those hit and those not. • Test changing those factors on hit pages but use this method of analysis with caution because the pages hit most might not be the pages earning you the penalty. • Make a list of your different types of pages. Eg, forum, quality article, low quality article, light category, quality category, product, blog post, etc. Put the list in a column in a spreadsheet and start building a table. • Add columns for relevant factors like ‘lots of ads’, little content, some dupe, all dupe, etc and also number of pages and % drop in Google US organic visits. Fill in the values for each type of page. • Look at how much of your site (% of pages) is taken up by your lowest quality pages and improve that. • If you are scraping or otherwise copying other site’s content, replace it with quality original content or test removing some (or even all) of those pages (and adding 301s from them to relevant pages higher up your site’s hierarchy). • If you have a large number of pages with dupe (of your own copy), weak or almost no content, improve them or remove (and 301) them or block them from Google with robots.txt. • If you have lots of pages that dupe your own copy (eg, as happens with some content management systems and on a lot of ecommerce sites that build new URLs for ‘faceted’ pages) then add rel=canonical tags to the ‘duped’ pages. This stops Google seeing those pages as dupes. • Edit any ‘over-optimized’ pages. • Improve anything that might make the user’s experience better. • Offer users more when they first enter a page. Eg, images, videos, attractive text and pages linking to your best, related editorial content. • If possible, make your content’s language more accessible and more real? • Promote your content on social media including Twitter and Facebook. • Build your brand awareness across the web wherever you can. • If you’re sure your site is ‘Google clean’ and worthy, let Google know about it but don’t expect this to have much effect. • Make as many of these changes as you can at once in the hope of shaking off the penalty quickly. With editorial content improving, you can then add back any marketing you are missing, in steps, checking to see you don’t get slapped again. Searching Google for Big Panda and Finding Decision TreesSEO by the Sea. 3 essential post-Panda content tips for ecommerce sites by Karon Thackston.